Quick & easy low carb breakfast muffins with spinach and feta. 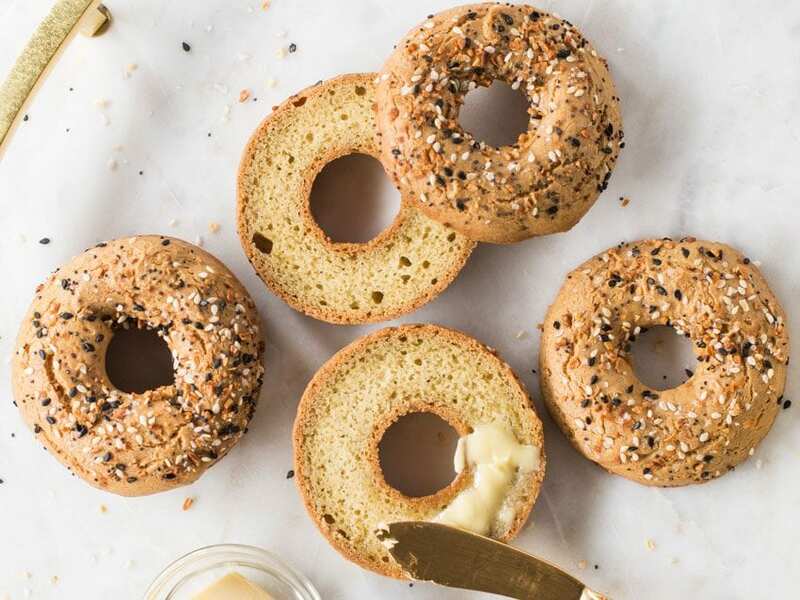 The perfect keto breakfast idea on the go. 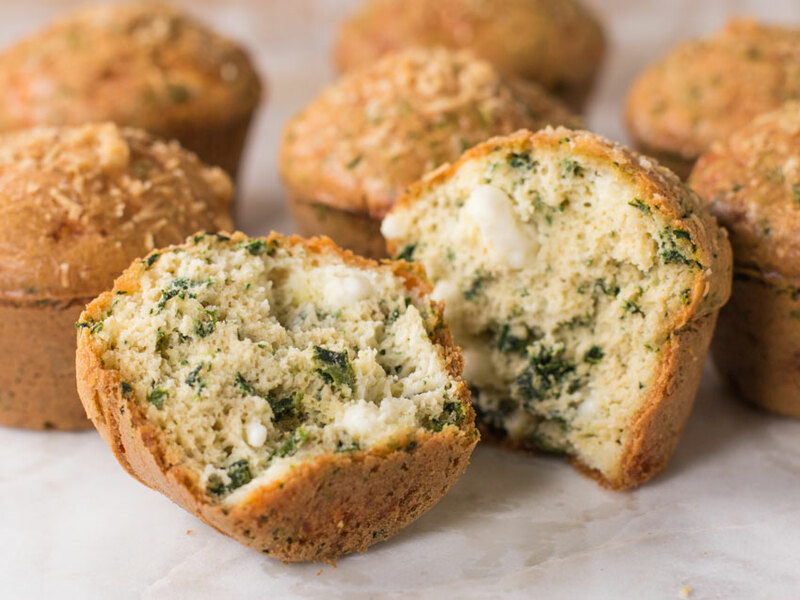 You guys went bananas for Dessi’s keto fat bread recipe the other week, so she decided to make the most epic low carb breakfast muffins loaded with spinach and feta cheese. These low carb muffins are made with 3 base ingredients: macadamia nuts, eggs, and coconut butter. 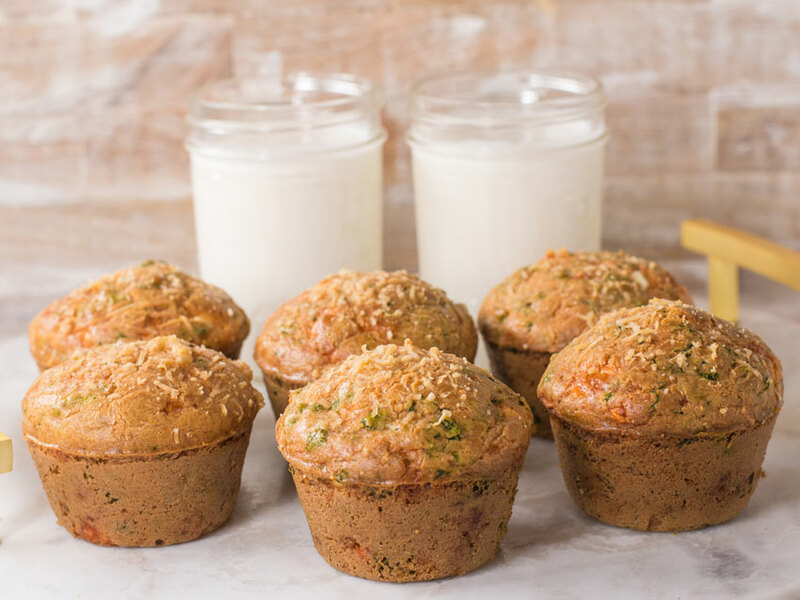 It is amazing how these 3 ingredients make for a moist and tender low carb breakfast muffin that you can grab on the way to work or school. We used a non-stick muffin tin and sprayed them to ensure they don’t stick, but you can also make mini muffins and the kiddies will love them even more! The key to these low carb breakfast muffins is to blend the batter very well using a food processor or you can also use a powerful blender. Just make sure to get the batter in the tins and in the oven asap as you don’t want the oil to start to sink to the bottom. 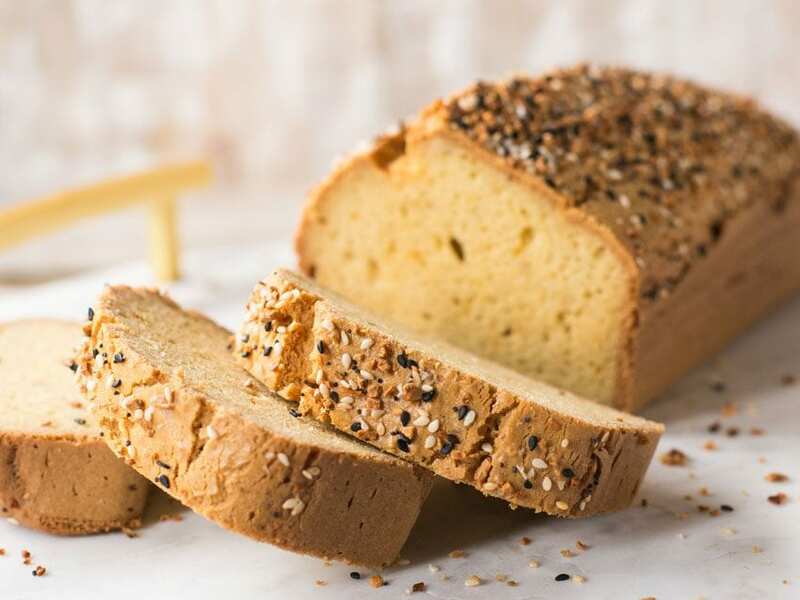 I have two other low carb bread options that you guys need to check out. 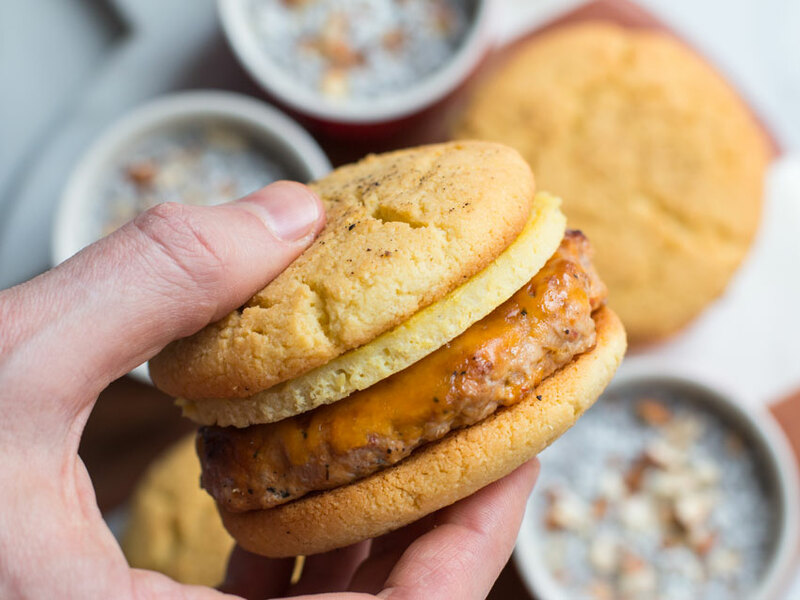 My almond flour biscuits make the perfect keto sausage Mc’muffin sandwich. 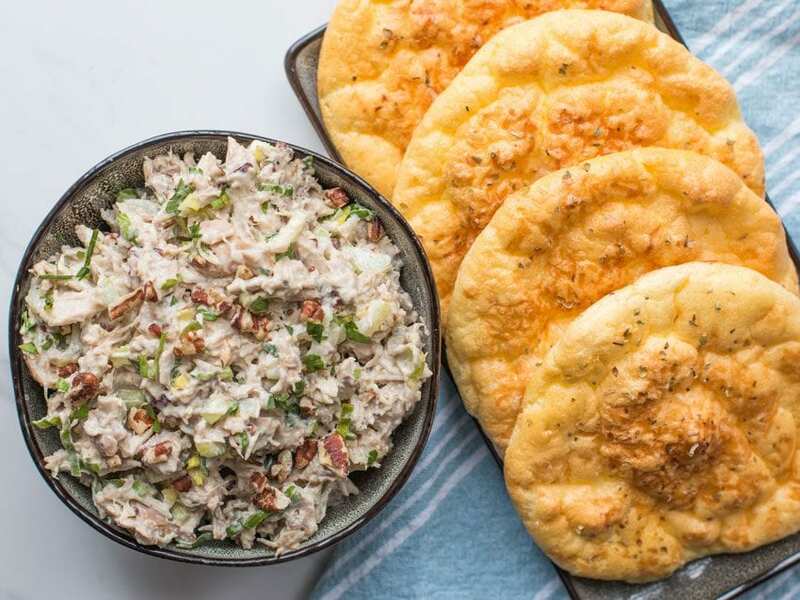 I also have a low carb cloud bread recipe that makes the perfect bun for my keto roasted chicken salad. Many people have been asking if they can use coconut oil instead of coconut butter. No, it is a very different product and they do not have the same texture. Use my Amazon link below to buy the coconut butter. That is the best price you will find. The muffins will bake for about 25 minutes or until well browned and a toothpick comes out clean. You will not find a tastier low carb muffin recipe anywhere else online. These muffins are moist, tender, and the consistency is perfection. Feel free to add different mix-ins or even add sugar free chocolate chips and stevia to make them sweet. For more low carb recipes that have huge flavor, check out the keto section of my website and YouTube channel. From breakfast, lunch, to dinner, I have some tasty low carb recipes for meal prep that you are sure to love. We Paired the recipes with aryan yogurt drink, which is a cool and refreshing drink on a hot summer day. Aryan is very typical in Turkey & Bulgaria and is made with Greek style yogurt, water, and salt. This recipe for aryan goes so well the muffins. 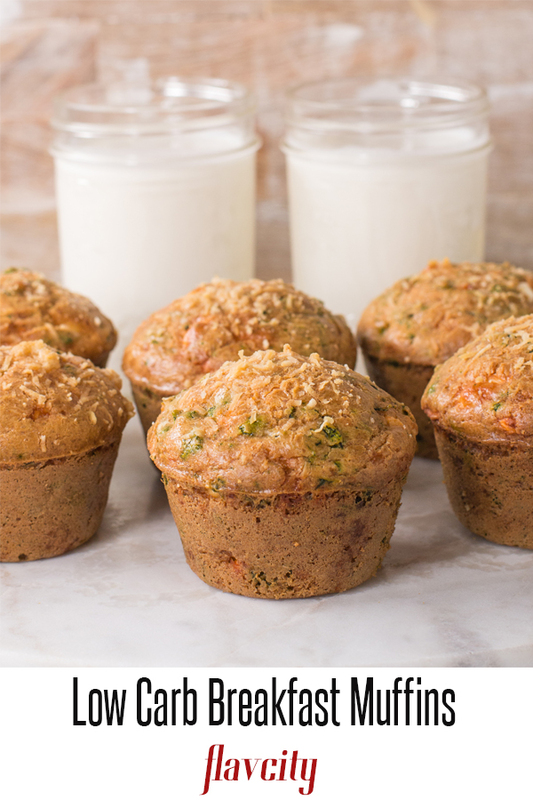 These keto fat bread muffins are low carb and perfect for a quick on the go breakfast. Pre-heat oven to 350 F and make sure the oven rack is set in the middle of the oven. Add the macadamia nuts to a food processor or a powerful blender and process for about 30 seconds, until almost creamy. While the machine is running, add the eggs one at a time, making sure each one has been incorporated into the batter before adding the next one. Turn the machine off and add the coconut butter and salt, and process until smooth and creamy. While the machine is off, add the baking soda, lemon zest & juice, and process for 10-15 seconds. Transfer the batter to a large bowl and add the feta cheese. You must squeeze out as much liquid from the thawed spinach as possible, otherwise it will mess up the consistency of the muffins. Once that is done add it to the batter and mix well. Spray a muffin tin with non-stick spray or rub them with avocado oil or butter. 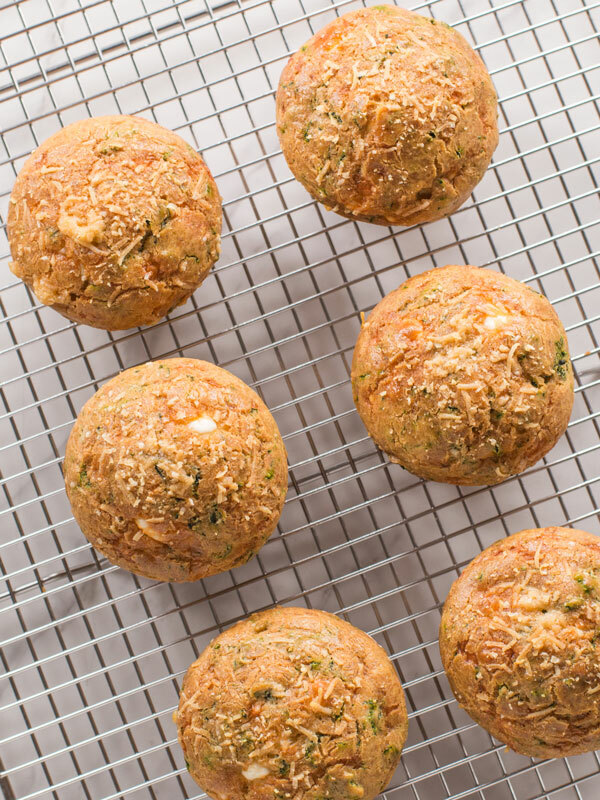 Fill the muffin tins just about all the way up and top with 1 teaspoon grated parmesan and bake in oven for 25 minutes. Muffins are ready when a toothpick is inserted and comes out clean and they are nicely golden brown. Remove from oven and allow to cool for 10 minutes before removing and serving. Enjoy! Recipe makes 9 muffins. Store muffins in fridge for 3 days or freeze for 2 months. Thaw frozen muffins and warm in a 300 F oven for 3-5 minutes. Can you substitute another cheese for feta? I’m not fond of feta. Otherwise, it looks yummy. Can’t wait to make these! The ingredients in the recipe say “baking powder,” but the instructions say “baking soda.” Also, a minor thing, the instructions do not tell you when to add the lemon zest. Hi-looks great! I see Amazon links for cooking equipment but not for coconut butter? Thanks! These look really good. They only thing for me is the spinach. I know everyone likes spinach but it is high in vitamin K and my husband and I can not have it. What else would be good? hi Nancy, the spinach is not necessary. Add grated carrots, dried cranberries, or grated and dqueezed zucchini! Something flew by me on your feed yesterday and I couldn’t turn on the sound. I think you were making cookies? You had a plate of cookies that were long and looked like they were chocolate dipped. They look like a recipe I make that is NOT KETO and I would LOVE to make them keto!! Very crunchy with almond flavor. What were they? Hi, can almond flour and/ or coconut flour substitute? Thanks! Hi Jen, not for this one… these flours won’t work. Can you substitute another nut flour for the macadamia nut flour – such as hazel nut or almond? unfort not..bc your are not making macadamia flour, you are basically turning it into a paste…and the other nuts dont have the right texture. Can i use almond flower or coconut flour instead of the purée of Mac nut? not with the proportions listed, it wont work. You can find other muffins recipes that use almond flour. I went on a baking frenzy this past Saturday night. Well, technically, it was early Sunday morning since I started around midnight. I made these, the egg bites and Macadamia Nut Bread (I went with Keto in the U.K.’s recipe versus yours because I wanted to try it as close to the original recipe before jazzing it up – but I guess these muffins are short of a jaxx-up of the Macadamia nut bread recipe anyway so I just liked 2 birds with 1 stone, right?). Anyway… KUDOS to Dessi for an awesome recipe. Kudos to Bobby for an awesome Starbucks dupe. Ok, I haven’t tried the original SB egg bites yet so calling it a dupe is presumptuous but oh well. I’m glad I found your YouTube channel! Wow, talk about a midnight baking storm, right on! You are set up for the week, enjoy all the goodies and thanks for the love! You should have a TV show. Your recipes are great! What size muffin? I have a muffin tin that has 12 muffins (@9″x13″) and another one that makes much 6 larger muffins (@ 3″ across at the top). 12 muffins 9×13….but the truth is,, you can use any size tin you want! This turned out great, but I had to improvise with the parmesan to taste. The ingredients list calls for 3 tablespoons of fresh grated parmesan, but the instructions only call for 1 teaspoon to be used as a topping. Just fyi. I ended up mixing all 3 tablespoons in with the batter, and topped with a little extra, before baking. Another great recipe! Delicious muffins!! These have become *instant stables for me! Flavor is spot on; texture and nutrition is perfect. I IF everyday w/low carb balance. I’d like to add flaxseed and chia for more Omega-3 and fiber. I know, could push from keto, but since that’s not my focus, it’s okay for me. Thank you for recipe sir! Glad to hear it, Michael! Definitely add some seeds, for some more nutrition! The recipe calls for coconut butter. If you don’t have it, can you use Kerry gold or other butter? Helen, you can use runny almond butter instead. Regular cow’s milk butter will not work. The coconut butter makes the muffins too coconutty for him. I don’t mind it. Do you have an almond butter recommendation for the subsititution? I like the Kirkland brand of almond butter that Costco sells. You would use almond butter in the same amount as coconut butter. Hi. When it says 1 c macadamia nuts, is that pre ground or after ground? Do you have PDF of the Recipes to save on tablets?? We don’t but you can easily make your own. On a Mac, when you go to the Print window there is an option to “print to PDF.” I think the Chrome browser for Mac or for PC will allow you to do the same, but there also is a free program out there called Cute PDF that will allow you to print to PDF as well. I know you have had a lot of comments on alternative nuts but I didn’t see Brazil nuts asked about which I think are also fairly high in fat. We have celiac in our house and a lot of nuts are cross contaminated with wheat. The only way I can get gluten free macadamia nuts is to order them from the U.S. (Canadian) which is expensive with exchange and duty. We have cooked many of your recipes and have had great success with them. Thank you for all your gluten free and keto inspired recipes! Brazil nuts are high in fat as you say. They could work, though you’d have to make sure you blanch them to remove the skins. I have tried the low carb breakfast muffins twice. The first time, I did not have the coconut butter so I replaced it with coconut oil. Big mistake! As you can imagine, the muffins were dripping oil!!! I almost used a whole roll of paper towel to absorb the oil. But they were very good so I decided to go buy coconut butter, which cost me $17 for the jar. (And I really do not see the difference in the texture. The jar is the same that you show on Amazon. To my dismay they were not as good and I still need a paper towel to absorb the oil dripping from muffin. Is 3/4 cup the right amount? I love that this recipe has cheese and spinach. But I cannot afford to try those again. Very disappointed. I did, both time use Brazil nuts instead of Macadamia nuts (could not find them) but the nuts turned out a nice paste. and on the internet they seemed to say that it could be a good substitute. Is it that I did not use the macadamia nuts? Why are the muffins dripping oil? A bit disappointed, but will continue to try your fantastic recipes. Not sure that Brazil nuts are a good substitute – I haven’t tried them. They might work, but you’d definitely have to blanch them to get rid of the skins. If these muffins are made according to the recipe they should not be oily at all. The recipe would work fine if you used macadamia nuts but substituted runny almond butter for the coconut butter – the almond butter is cheaper. Thank you for for your response. I must say I did not blanch the Brazil nuts, and I used goat cheese instead of Feta. Had fresh spinach instead of frozen. Probably too many substitutes to give it a fair chance. If I had known that I could use Almond butter, I would have tried harder to find macadamia nuts. It is not labeled as “runny.” We are just referring to its consistency – it is very loose rather than a thick peanut butter.